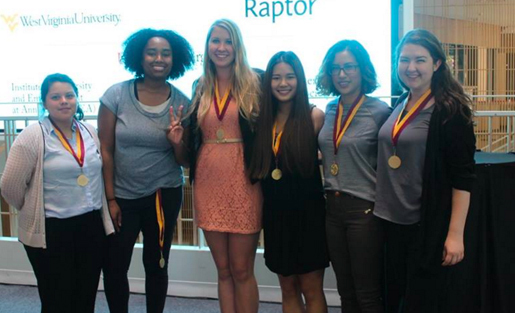 The winning team at the Hack the Gender Gap at USC. Photo by USC Annenberg. Much has been said about the lack of voice and opportunity for women in both journalism and technology, especially when it comes to business and leadership positions. With this in mind, MediaShift and the USC Annenberg School for Journalism and Communication produced a weekend Women’s Hackathon from Oct. 9 to 11, 2015, at USC’s Wallis Annenberg Hall in Los Angeles. It was designed to both help students and practitioners develop the technological and entrepreneurial skills critical to the journalism jobs of the future, as well as to offer a place for women to share ideas and experiences — to help each other succeed. The focus for this year’s sold-out event was immersive journalism and virtual reality (VR), with attendees breaking up into teams to create and pitch their own startup ideas around these themes. The event follows in the footsteps of last year’s successful Hack the Gender Gap Conference with the Reed College of Media at West Virginia University and panel at Google in Silicon Valley, and was made possible with support from the International Women’s Media Foundation (IWMF), WVU’s Reed College of Media and Knight-Mozilla OpenNews. The Friday panel about women in media and tech was sponsored by Raptor Group. "Was so inspiring to see so many young women digging into technology!" We’ve rounded up a collection of photos, coverage, feedback and a Storify highlighting the top moments on the #GenderGap hashtag on Twitter during the weekend. Did we miss anything? Let us know, and we’ll update the post. Here’s a selection of feedback from participants. Some included their name for a testimonial, while some was anonymous.